• Running the Kilimanjaro Marathon this year? This past week had a great blend of what makes ISM an interesting school. We started the week with a visit from universities representing Canada, the United Kingdom and The United States. Then we were able to witness the different passions, skills and ingenuity of the M5 students at the Personal Project Exhibition. Talking with some of the PYP students that went, each seemed to have their own favorites. The week continued with a foray into French, plunges into the pool, a house point battle and more. Friday allowed the community to show off their skills in various performances and Saturday we took to the pitch and courts for football and basketball. With all of this, I think everyone is looking forward to the up-coming long weekend. Please note that we have the Farmers’ Market on February 23rd. Running the Kilimanjaro Marathon this year? It is free to set up and you can set your own financial target. There are no penalties for not hitting your target and all the money will come directly to our UK Charitable Trust for the support of future scholarship students from around the world, including refugees and students from diverse economic backgrounds. For our Diploma students, learning is not just in the classroom. 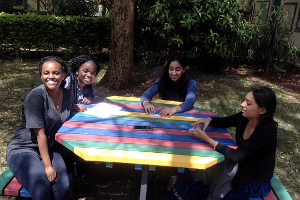 Collaborative activities among students occur in many places around campus including the new colorful benches made from recycled materials. The Diploma students have focused recently on relationships in their Life Skills classes and intertwined with this for today’s adolescents is social media – an area addressed in The Secret Social Media Lives of Teenagers from The NY Times – http://nyti.ms/2H2pmbi. Friday May 18 from 9am-12pm parents, relatives meet in Karibu Hall to enjoy the community spirit/decorating with their D2 son/daughter and help to decorate the hall for the graduation. At 6:00pm there is the Graduation Dinner at AMEG Lodge. Saturday May 19 Graduation at 2:00pm followed by the Graduation Tea in the Director’s Garden. Please note that ISM families receive a discount at Ameg Lodge. 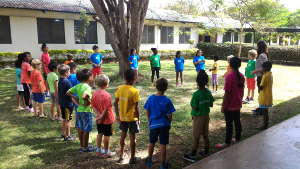 The boarders were kept busy this weekend, with various activities planned which included the variety show on Friday evening, and the NTAA tournament on Saturday. Next weekend will be the ISM four-day weekend. As mentioned earlier, a group of boarders will leave for Pangani on the morning of Friday 16th and return on the evening of Sunday 18th. A good number will remain on campus, while some have indicated that they will go home. If students are heading home, please remember that they should be back on Campus by 6pm on Monday the 19th, as classes will resume on Tuesday, 20th February at the normal time. School will close for Quarter 3 on March 23rd, and boarders return on Tuesday, April 3rd. We still have three OP trips this year that still have spaces available. If you are interested please contact me or Mr Foya to reserve a space. These trips are a highlight of many students’ year. 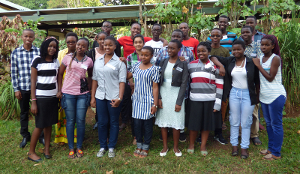 The Usambara and South Pare trips are also key to students who wish to progress further in the OP levels. Last week our Ultimate Frisbee team took part in the first ever NTAA Invitational Tournament at ISMAC, it was a great sporting event, and the Leopards came home victorious after winning all their games and coming in first place. On Saturday February 10th our U15 Football and U19 Basketball teams were back in action at SCIS for the 2nd round of the NTAA. Teams and coaches were looking forward to getting back into action. Stay tuned for the results. Thursday February 8th secondary students competed in the 2nd Inter-house sports day. This event combined swimming and sports. Meru House is the “unofficial” winner, as the swim results are still being tabulated. The final results will be announced on Monday. As the season and year progress please keep up with all the info, news, and sports reports by reading the Moshi Campus News. We are grateful to all members of the school community who graciously found time to come for the M5 Personal Project Exhibition. Your feedback was received with gratitude. The Personal Project final reports are due on Feb 14. Similarly, ePortfolio assessments in Language Acquisition (English, French), Arts (Drama, Music, Visual Arts), PHE and Design are going on and the grades will be submitted by mid-March. In order to give the M5 students adequate preparations for their final examinations, we have scheduled for an on-screen mock examination session in English Language & Literature, Integrated Humanities, Integrated Science, Mathematics and Interdisciplinary Learning subjects starting March 6. Students will also complete a paper-based Kiswahili Language & Literature mock exam. We are grateful to M5 parents who have so far submitted the Work Experience location details for their children. We are now embarking on preparations for the requisite introductory letters to these institutions/organisations. Soon we will hand these letters to all students whose submissions have been received by Feb 15. In order to set the tone for this exercise, we have arranged for a Careers’ Day on March 22 featuring different professionals within the ISM community. We are grateful to the many prominent professionals who have since accepted to guide and counsel our students on this day. If you are interested in sharing your work experience with students, please contact me. Under the guidance of the language teachers, M3 students have begun making choices of what languages they plan to study in M4 beginning next academic year. They will also move from taking all three Art subjects to selecting just two from the current subjects of Visual Arts, Drama and Music. In Mathematics, they will be counseled on the move to either Standard Mathematics or Extended Mathematics. Extended Mathematics is meant for students who intend to opt for Higher mathematics at the Diploma Level. The M4 students currently take two Art subjects. As they go to M5, they will drop choose one of them to pursue. Parents are requested to discuss these choices with them before final decisions are made towards the end of Quarter 3. 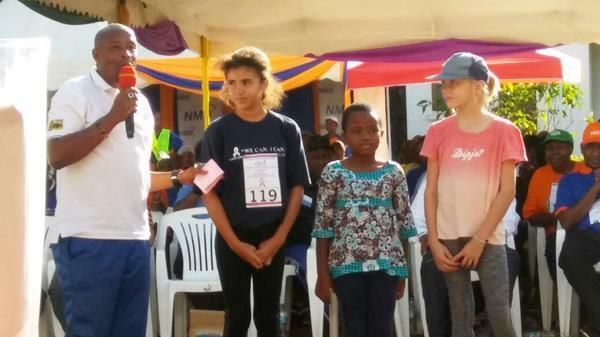 This past Sunday KCMC organized a walk for World Cancer Day to raise awareness and money. A big thank you to those that participated in the event. Please be on the lookout for upcoming KCMC events like blood drives. 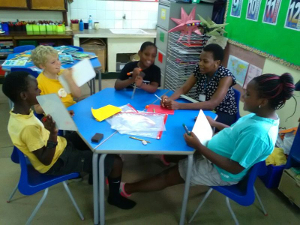 This week, students from Primary and Secondary studying French, had the opportunity to put into practice their knowledge of the French Language. 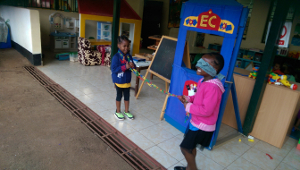 Led by two guests from The Alliance Française in Arusha, the students enthusiastically participated in different activities and games. Next week students in P4 to P6 will start taking the online MAP testing. This is a test that the school has selected to replace the ISA tests students have taken in the past. There is no need to study or prepare for these tests. These are non-timed tests that are adaptive so that students will be able to demonstrate accurately their current skills and help inform teachers what they are ready to learn next. There are tests in Reading, Language Usage and Mathematics. Students will start with a warm-up session prior to the tests to familiarize themselves with the layout. Then each day they will go through one of the three tests in an hour-long session. As these are not timed tests, students are not required to finish during those sessions, and extra time will be made available to them in additional sessions. After the testing when we have the results we will have time with parents to explain more about the reports and answer questions. In the meantime, if you have questions, please contact me. The last seven days have been quite exciting for our Primary School. On Saturday our U11 Basketball Team won their first tournament at Braeburn. Congratulations! On Monday the Primary children enjoyed viewing the M5 Personal Projects which were on display in Karibu Hall. They asked our oldest Middle School students lots of thoughtful questions and were curious to try out their various models and designs. On Wednesday they became risk-takers by testing out their French speaking skills on the Alliance Française visitors and on Friday evening they took risks again by performing at the PTA Variety Show. This weekend some of our children, and their parents, will show off their determination and tennis skills at the tennis tournament on campus. Good luck everyone! Good luck also to the Mtuy brothers who are competing in the 10to4 Mt Kenya mountain bike challenge; helping to raise money for the Mt Kenya Trust. Along with the other riders they are starting at an altitude of 10,000ft and dropping through alpine moorlands, forests, and plains to end at a wildlife conservancy at 4,000ft. We cannot wait to hear all about it! The Primary 5 and 6 students fielded a mixed basketball team at Braeburn School this past Saturday. With excellent passing, speed and movements including individual skills in lay-ups and 3-pointers, our usual ISM team spirit carried the day. Unbeaten throughout the tournament, I’d like to extend a huge congratulations to the team and coach Eli. EC were excited to watch the successful launch of a large rocket from Cape Canaveral this week. The ‘payload’ was an open-topped car with a ‘pretend’ spaceman driving. This car was sent into orbit on the rocket, and fired off towards Mars as part of a plan to colonise the planet over the next 20 years. Lots of discussion, art and writing took place about how it might feel to be onboard a space mission and which of our senses we might use. Next week on Thursday we will be meeting our agriculture volunteer Andrea and making a bid to produce a useful design for the new school gardens. In mathematics the children have continued with their number pattern work, e.g. counting in steps of 2, 5 and 10. In English they have been working on their writing projects, entitled, “If I could stay up all night.”. They were able to answer questions of ‘why and why not?’ This helps them to learn about the concept of taking responsibility. Next week they will turn their written sentences into paragraphs. They will also practice how to present their work to others, i.e. building good communication skills. Please note that this week’s homework is due in on Thursday, because of the ISM holiday on Friday. The P2/3 class have enjoyed a wonderful learning experience with our student teacher Ms. Makayla. She will continue to work with the class next week as well. They enjoyed sharing their comic books with the P6’s on Friday. Well done! 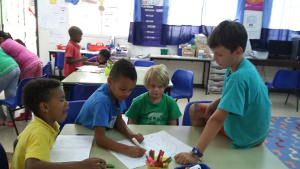 The children have made an excellent start to our unit and are keen to begin researching into different forms of transport and systems that they are curious about. They will be using the author Gail Gibbons as an author study. The class will be writing their own “transport shape” poems. We will be looking at different types of words that can be used to show the sound or movement of a form of transport. In Math, the children will be interpreting data and using this to answer questions about the data collected. Next week will be a short week as Friday and the following Monday are holidays (No school). Students have been thinking deeply about nature and have been looking at art in the style of Sally Morgan. They have begun to look closely at their work and see how mimicking some of the elements of the experts can help develop their skills. 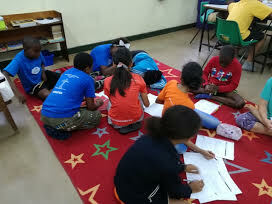 In our Unit work we engaged in role playing activities where the students were expected to use their negotiating skills and strategize in order to meet the needs of their group. They learned that wants can sometimes impede success if they are prioritized above their needs. Learning about division in math is helping us to see how resources are shared in our classroom and the relationship between supply and demand. practicing following instructions and speaking in French. Advance notice – P5 Primary Gathering will take place on Friday, 23rd February at 7:35 in Rafiki Hall. The P6s enjoyed learning from the P2/3s who shared books that they had written. The students were also busy inquiring into how different countries source and use energy. The P6s are very enthusiastic about the PYP Exhibition and are already brainstorming issues they would like to inquire into. In the coming week, we will be reviewing Math concepts we have learned so far and also continuing with data handling that is related to our unit. The students are learning new vocabulary through articles and videos on energy. It is a knowledge-based unit so researching is imperative. We will be setting up various science experiments to deepen our understanding and this is where parents can come in and share their expertise.